Double (Dublerzy) begins with two Poles getting mixed into a bad situation at wedding in Sicily. But this isn't any wedding but one of a powerful Mafia family. Leon (Andrzej Grabowski) and Max (Robert Gonera) find their common heritage brings them together quickly as they both become targets. Dodging bullets the pair flees the event to return to Poland, but the family doesn't forget. Luck brings the pair back together again a half year later and bad luck brings them back into the path of the mob family that wants them dead. Of course, dumb luck keeps bringing them all together over and over with hilarious results. Although at first I was undecided if Dublerzy is a comedy with a lot of action or an action movie with a lot of comedy; but by the end, I have to say there is a lot more action. The movie has a lot of shooting scenes and the action does not let up. It probably isn't too far of an exaggeration to say that there is a fight or a shooting scene every five minutes. But the humor helps take away any seriousness the movie could have and the action keeps it from getting dull. The Italians charters actually speak Italian, which is also a nice touch. In addition to those named already, Dublerzy has a lot of famous Polish actors including Krzysztof Kowalewski and Krystyna Feldman. It is also the last movie the late Marek Perepeczko stared in (who played Janosik in the TV series with the same name). On the other hand, it also has the acting debut of Kayah, who is a popular Polish singer. 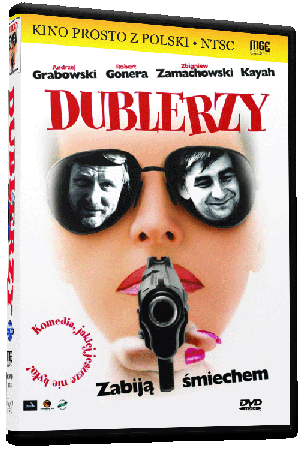 Dublerzy (2006) is directed by Marcin Ziebinski and it is quite a change of pace from the suspenseful thriller (Gniew) he made some eight years earlier.